It's time for a giveaway on my blog and this one is short and sweet so don't delay getting in your entry! If you'd like to take part in a jewellery workshop in my studio then this might be just the giveaway for you. 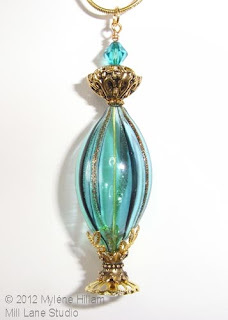 I'm running my Genie Bottle/Faux Perfume Bottle necklace workshop again and would love to have your company. But there's a catch - the workshop is on Saturday morning 25th February 2012, so you must be in Brisbane (or be able to get to Brisbane) to win this one. No previous jewellery making experience is required.... I'll teach you everything you need to know to complete this gorgeous project. The prize will include all the materials you need for the class too. You even get to pick the bead of your choice (I have some yummy beads in my stash!). And for all you paper crafters out there, we'll also be creating a gorgeous little presentation pouch to make this a perfect gift for someone special. To be in the running, please leave your comment and I'll draw the winner randomly on Thursday morning. Don't forget to leave your contact details so that I can contact you if you're the winner. Mylene, I love your jewellery and your workshops are great fun. Hope I am lucky enough to get to this one. That is gorgeous. I would love to learn how to do some of the wonderful things you do.